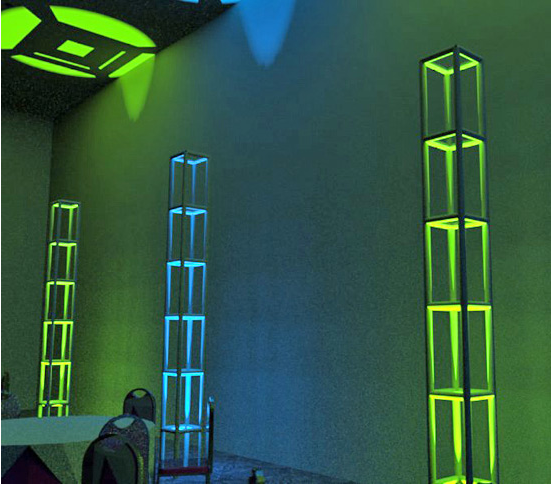 Your client has requested a cool, architectural look for their event—not exactly cold, but not warm and fuzzy either. One of the hottest trends in cool lighting is upright columns of truss that are uplit and placed strategically around the venue. A. First you have to create the uplighting. B. Second you place the upright truss over the lights. 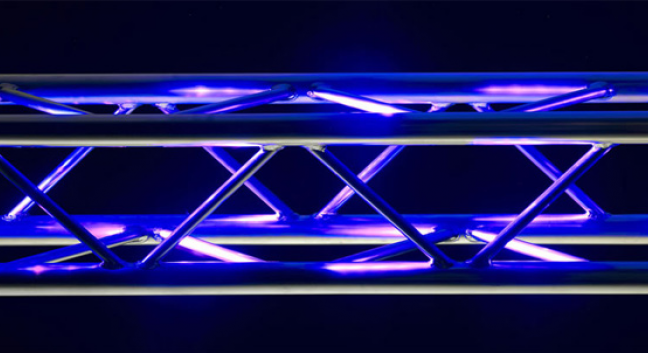 The uplighting procedure involves attaching lights to a piece of truss that is placed right under the floor of your Vivien venue, and then rotating the truss so that only the top portion of the light is visible, shining up to the ceiling. 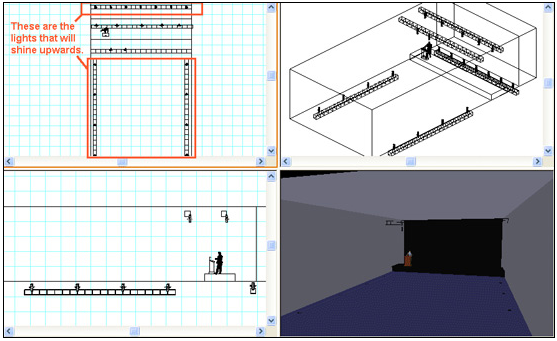 The steps for uplighting were outlined in a Vivien News tip called Uplighting, which was published last summer. To avoid repetition, please follow the steps in this article, adjusting the size and location of the truss and the number of lights that you attach to it to match the number of pieces of upright truss that you want to place around the room. Once you are satisfied with the number of lights that you have placed around the room, proceed to the next procedure. This procedure assumes that you have already created your Vivien venue and have placed a series of lights shining toward the ceiling, as described in the Uplighting article. 1. 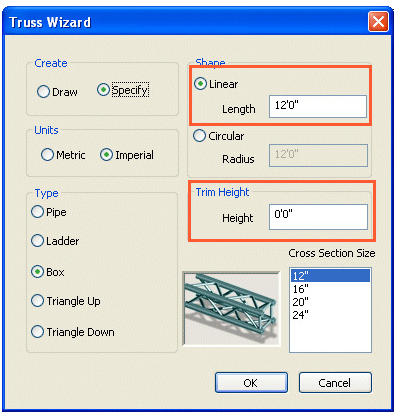 In the Drawing Quad tab, click the Truss Wizard icon. 3. Leave all other default values, and then click OK.
5. Click the bottom left quadrant of the tab, and click the Front View icon to switch to Front View. 6. In the Front View quadrant, click to select the truss you just placed, and then right-click and select Rotate. 7. Click on the end of the truss that is right over the light, choosing this as the central point of rotation. 8. Type -90 and press Enter. The truss rotates 90 degrees upward. Note: Based on the location of the truss (either the right or left side of the room), you need to type a minus sign in front of the rotation angle to rotate it 90 degrees upward. To rotate the selected truss (shown in the diagram), you must type a minus sign (- ) before you type 90. When you start typing, the Command Line automatically appears at the bottom of the Vivien window. 10. Click the Plan View quadrant (by default it is in the upper left corner). 11. Click the Point Snap icon. 12. Click the Tape Measure icon . 13. Click on the first light in the series (the one with the truss over it), and then click on the next light in the series. 14. Note the distance between the two lights, as displayed in the bottom left corner of the window. 15. 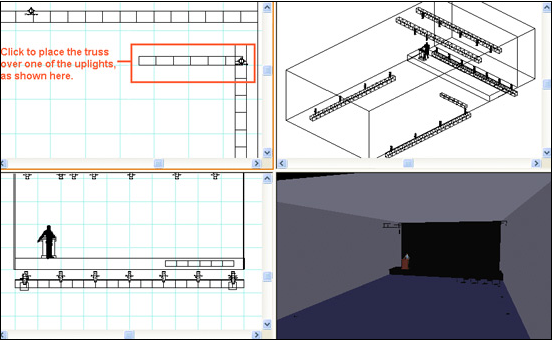 Click to select the truss and select Modify > Clone > Linear. 16. In the Number in row box, type the number of pieces of truss that correspond to the number of lights in the current row, including the selected piece of truss. For example, if you have already placed a piece of truss over the first light in a series of four lights, then you would type 4. 17. In the Interval box, type the space between each light, as noted in step 14 (in this example, you would type 12’). 19. Manually adjust the spacing of the truss, as required. 20. 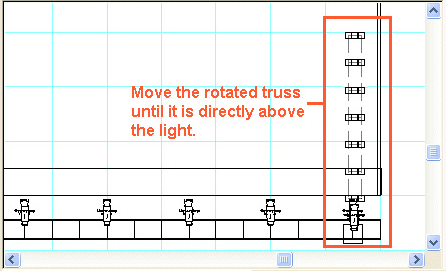 Repeat all steps to place truss above the other lights in your drawing, as required. 21. Add color and intensity to the lights as desired. For tips on lighting, see the online tutorial Lighting tips and tricks.